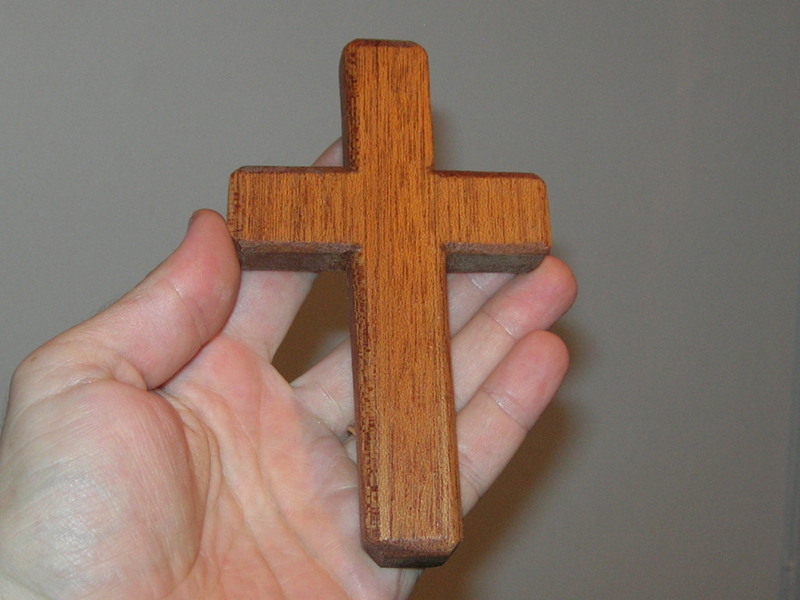 Yesterday I decided that each year I’d make a cross on Good Friday. Not only would this result in something meaningful each year, but it would also give me a gauge as to my progress as a woodworker. 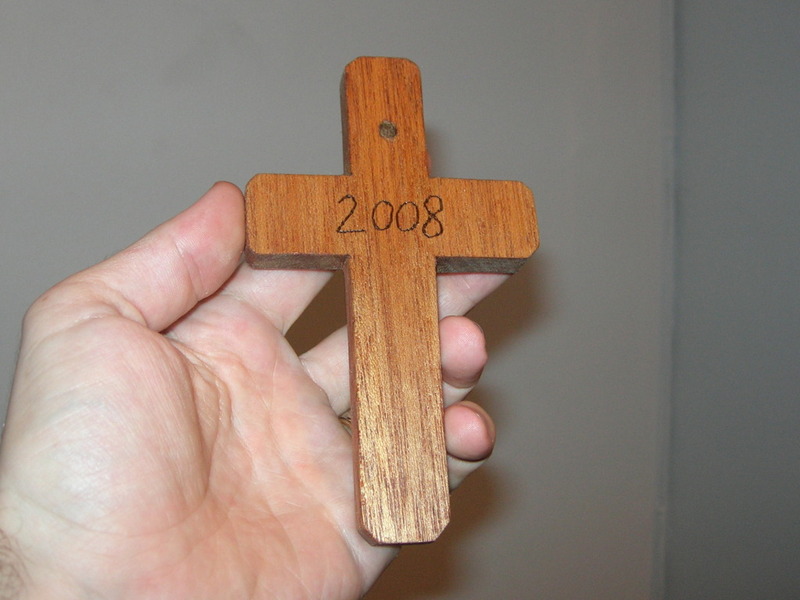 So this my first year, I thought I’d go as simple as you could get: a cross cut from a single block of wood. Sounds easy, but I still managed to take a few hours doing it. But still, I’ve never had a “weekend project” that didn’t take weeks (or months) to complete, so I felt quite a sense of accomplishment at having gone from rough lumber to finished product (except for 2 more coats of finish) in a day. I got to try out some new skills doing this, like chamfering (which I’ve never done before). I did an initial chamfering with the chisel, but later found that sandpaper does a pretty good job too. I did have to tinker with my chamfers on several occasions when I accidentally went a bit far with chisel or sandpaper. I really like the way inside chamfers meet, but I’m not sure what the outside chamfers should look like when they intersect – mine are all over the place. This is also my first time trying the BLO-varnish-mineral spirits mixture for finishing. It’s what I plan to use on my wife’s box, so this is a good test run. I’ve already applied one coat (which was dry enough for me to handle for these pics) and will add two more tomorrow (AM and PM). Not sure how to handle the piece while it dries, I had it resting on four nails which were pushed through a piece of cardboard. Oh, and I’m not sure what kind of wood this is. I got it from what used to be part of a drawer. I’m guessing it’s meranti, since that wood is so plentiful here. Not the greatest piece of workmanship, but a good place to start, I think. Happy Easter! Hey, what agreat idea! It offers so much on so many levels. What a surprise to see you turn up on my blog, Eric! Woodworking! I never woulda thunk it. How yous all doin?